World Brand Laboratory published the list of “China’s 500 Most Valuable Brands 2017” in Beijing. Phoenix, with a brand value of RMB51.87 billion, came third behind CCTV and China Daily, out of 35 media companies. Phoenix breaks into the list for the 14th time since it was first introduced in 2004. 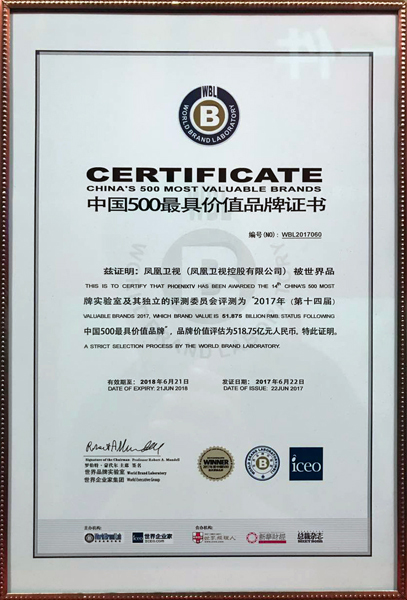 The ranking of “China’s 500 Most Valuable Brands” comes from World Brand Laboratory’s analyses of the company’s financial status, consumers’ behaviors and brand impact. Companies are chosen from 25 fields such as food and beverages, textile, information technology, household appliances, automobile and energy, besides the media. World Brand Laboratory is one of the three global authorities on brand evaluation. Observing the principles of independence and impartiality, it issues annual study reports which are widely referenced by various industries. The organization is made up of consultants and experts from Harvard, Yale, MIT, Oxford, Cambridge, amongst other prestigious academic institutes. 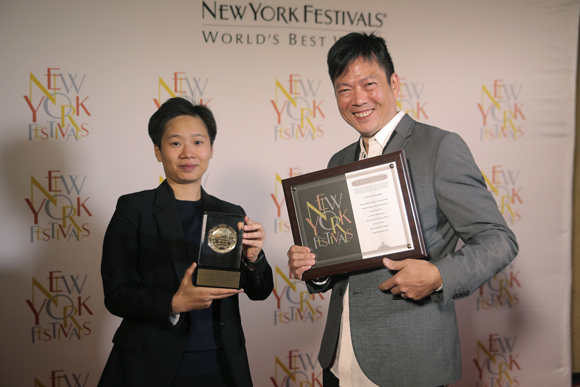 At the New York Festivals 2017, Phoenix bagged three awards, the quality of its productions was recognized by its overseas peers again. The promotional clip is a vibrant, colorful cocktail of graceful motion, winning the Gold World Medal in Art Direction, as well as a Finalist Certificate in Special Visual Effects, in the Television Promotion category. 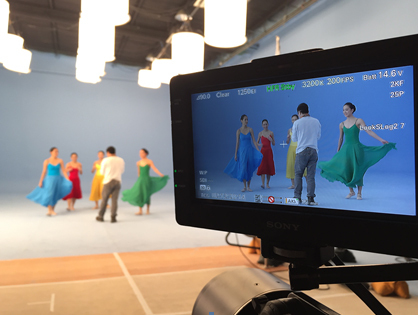 Directed by Heidi Cheung, the clip features five colors that embrace the design of Phoenix Chinese Channel’s logo, and the pictures represent a “dance with the time” that looks forward to an exciting future for the media. An agile kitten going after a target brings out the theme of Phoenix Focal Point promotional clip. It is a perfect symbol of the programme’s sharp insights into stories we are all talking about. The strong visual contrast, the swift action and the cute kitten all come together to win a Finalist Certificate in Production Design in the Television Promotion category. Entries came from more than 40 countries this year. Other award-winning media networks included famous brands such as the BBC, CNN, Al-Jazeera, ESPN, FOX, etc. The “You Bring Charm to the World Award Ceremony”, which was held in Tsinghua University on 31 March, the ceremony is set to honor and commend those prominent Chinese individuals and organizations for their great contribution to and having significant impacts on the world. Among the eleven who received awards this year were Ieoh Ming Pei, the last master of high modernist architecture, Action movie star Jackie Chan, the winner of the Hans Christian Anderson Award in 2016, Cao Wenxuan, a Chinese professional boxer who has held the WBO flyweight title since 2016 Zou Shiming, Zhang Shou Cheng, Yao Chen, China table tennis team, Shu Lam, Yan Ning, Shen Zhou 11 team and Zhao Zhong Xian. 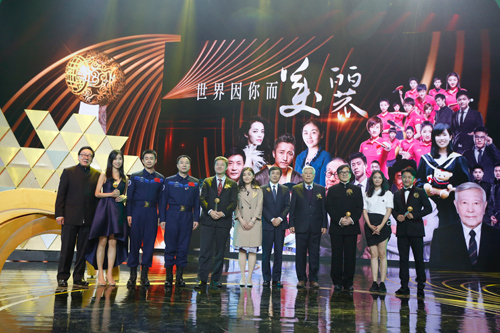 The Hong Kong office of Sina Weibo held the “Weibo Ten Most Influential Awards Ceremony of 2016”, which identified the most influential enterprises, media groups and the most popular topics in Hong Kong. Phoenix relied on its overall active presence on Weibo, its power of communication, and overall coverage to win the award for being the number one of the “Top 10 Weibo Most Influential HK Media in 2016”. 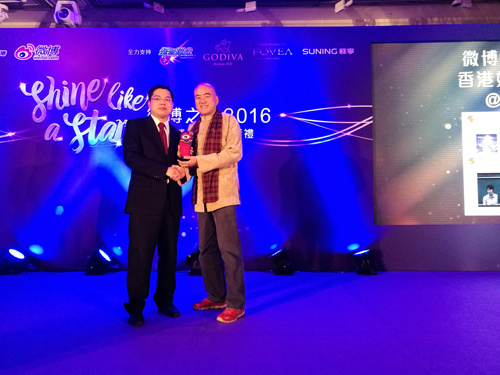 The Deputy Head of Phoenix Chinese Channel, Mr. Cheng Helin, accepted the award. Phoenix was honored at the 53th Chicago International Film Festival, held on March 24, for the sixth year in a row. “Journalist On The Spot: Syria: Between Ashes And Roses” wins Silver Plaque in Special Achievement in Cinematography. Promotional clip of “Life Code” awarded a Certificate of Merit in Visual Effects.